What a fun theme this weeks #SundaySupper is! 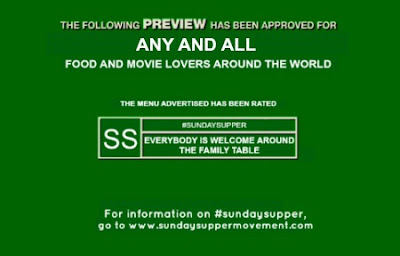 Our host this week, Heather at Girl Chef came up with a Movie inspired #SundaySupper. In the beginning, I had a very hard time coming up with a meal which inspiration came from a movie. I almost sat this week out. On Gabe's birthday this past week, he asked me to make seared Tuna. This made me instantly think of Tim Burton's movie Big Fish. I first saw Big Fish on a plane, heading to Vegas. The movie reminded me so much of my Grandfather, a man who won multiple Lions Club trophies for telling the biggest lie. The man was a story teller beyond words and every time I watch Big Fish, I get teared up with memories of my Pop Pop. I found a recipe for Spice-Rubbed Seared Tuna Steaks with Balsamic Reduction and was intrigued to give it a try. I have always used Asian inspired inspired flavors while making Ahi and this was a new twist. I am very thankful I stirred it up. The Balsamic reduction is so complimentary of the spice rub on this recipe, it made this dish stand out. We liked it so much, I am repeating the recipe this week. Make sure you only sear the tuna for one minute each side so you wont over cook it. Also, it's best to use a cast iron skillet for this recipe so you get a nice sear on the fish. Slice the tuna fillet into 4 equal size rectangular steaks (I had my butcher cut the Tuna into two 8oz portions). In a small bowl, combine the salt, coriander, paprika, and cayenne pepper. Lay the tuna steaks out on a plate, and sprinkle the spice mixture evenly on all sides. Evenly coat the tuna steaks with the freshly ground black pepper, and gently press it in, so that it adheres to the surface, being careful not to smash the flesh. Place a cast iron skillet over medium-high heat. Add the oil and swirl to coat the pan. When you see small wisps of smoke, add the tuna to the pan and sear the steaks for about 1 minute per side. Remove to a cutting board. For presentation, cut each steak diagonally into 4-5 slices and fan on a plate. Serve with a small amount of sauce drizzled along side. Garnish with additional lemon if desired. Note: Seared Ahi tuna is best cooked rare to achieve its wonderfully meaty flavor and buttery texture. Overcooking will make it dry and "fishier" tasting. Let's take a look at what the rest of the #SundaySupper group is making this week! Ahi tuna is my fav. I love it! This recipe looks beyond fabulous. Thanks Jennie! It was so simple too. You should give it a try! 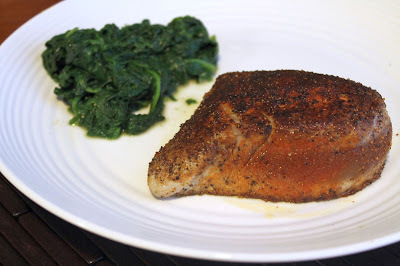 I am always looking for new ways with fish and this sounds great I am a fan of balsamic and tuna and I just happen to have some lovely tuna steaks in the freezer so I can't wait to try this. Yum! Love it Stacy! I am curious to see how frozen Ahi would be in this recipe so please let me know. Love this recipe! I adore Ahi Tuna and look forward to trying it! Hooo-weee, that is a beautiful piece of tuna right there! I love the relation to your grandpa and Big Fish - so fun. And I really love this recipe...it sounds mouthwatering. Ahi tuna is fantastic, and I love how your seared tuna looks. I'm actually salivating right now! I'll definitely be giving this recipe a try. I've never seen the movie "Big Fish," but now it's on my Netflix list. Thanks for sharing! Alaiyo, the movie Big Fish is a tear jerker and one that will make you laugh for sure. Coming from you, this means a lot! Canned Tuna? No Thank you! This, I love this! Such a pretty dish and your balsamic reduction sounds amazing. Thank you for sharing! Wow your tuna looks amazing!!! And the balsamic reduction is perfect! Love it! Who would've thought balsamic and tuna! It worked perfectly though. Thank you! Your tuna looks awesome!! I haven't seen Big Fish but have heard so many good things about it. This week's theme is having me make quite a list of food to make and movies to watch. Big Fish is such a great movie. One of my faves! I just tried seared tuna for the first time last week and LOVED IT! I was kind of hesitant to give it a go but am so glad I did. I dipped it in balsamic and mustard, so I bet this reduction is fabulous! That's awesome Laura!! Seared Tuna is how I started eating sushi. Now I prefer ahi raw vs. seared. What perfectly seared and cooked tuna! So many people over-cook it and it takes away all the flavor. I'll have to try your balsamic reduction next time I make it for a nice change to the usual soy sauce. Thank you Renee!! The Balsamic reduction, as weird as it sounds, was perfect. Oh, I'm swooning....rare tuna is one of may absolute favorite entrees. I will have to try it with a reduced balsamic. What an incredible combo!!! What a great choice... I adore Big Fish, it is such an interesting and beautiful story, one of my all time favorite movies. Beautiful tuna recipe too, thanks for sharing it and also about your Grandfater! I have not seen that movie but now have to. Your recipe looks so very good. I have to try it. Tara, Big Fish is a must see! I love the movie Big Fish. It is such a sweet story! It was a movie that I had never heard of, and saw the DVD at my in-laws, and put it to watch one day when the weather was bad. What a pleasant surprise! I loved it! Such a great movie Conni!! Adding Big Fish to my Netflix list! I adore seared tuna, but I don't think I've ever paired it with balsamic. Like you, I generally go Asian. I'm going to give this a try - thanks for the recipe! Hi Shelby! It's surely a flavor change to the Ahi steak. I really enjoyed it! I am definitely jealous of this amazing dinner! It looks like perfection...I would definitely not be confident enough in myself to cook it with such a perfect sear and pink center like you did! I keep meaning to add Big Fish to my queue to watch on Netflix - I love Ewan McGregor and I am not sure why I haven't managed to view it! You could so make it - better yet, lets have a dinner date one night and we can cook it together and watch Big Fish! Double score! Sarah, I am right there with you. I prefer my Ahi sashimi style so I only seared it for one minute on each side. It was perfect with the balsamic! I've never seen that movie but I will say that tuna looks perfectly seared and that's hard to do! Great tie in! My favorite movie!!! Tuna looks awesome! Knew you would love this tie in!!! What a great looking tuna steak! I've never cooked one before, but pairing it with a balsamic reduction sounds perfect. Brandie, it is so easy to do at home as long as you have sushi grade tuna (harder to find than it sounds). You have to give this a try! Love Ahi Tuna...in part because it's a fish that easily works with red wines. In fact, it's "red meat" in my mind;-) Great looking recipe! Yum! We love Ahi Tuna, but I've never thought to make it myself. This looks amazing! Oh yum! I love seared tuna and yours looks perfectly done. Also love your dipping sauce. Sweet with a little bite from the lemon. Nice! That sounds like a good movie to watch...the list continues to grow :-) And this Tuna looks quite nice especially with that balsamic reduction! I just came across this searching for tuna recipes, and we made it for dinner this evening. 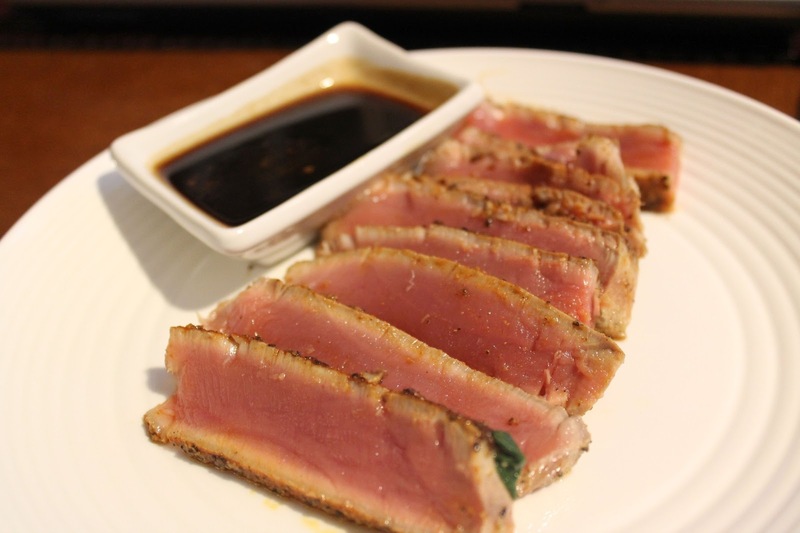 This seared tuna was quick and easy and fantastic, using our recently harvested garlic in the balsamic reduction. The dish was perfect for a late summer dinner after working in the yard until nearly sunset, and went well with grilled egglant, tomato salad and potato salad all from the garden. Thanks for posting it!